Many people write books. Many people read books. Any kind of books. Authors spend time thinking and re thinking everything that goes into it. They take utmost care into what goes into it. They think 10 times before putting down a single sentence. Hence there is always something artificial about books. The thought process has been adapted to be very lucid for the reader to follow. But what if we write about the birth of an idea from its inception (when it takes birth in a human mind), and follow it as it matures in the mind of the same human. I endeavor to do that here. It might not be just one idea. It might be many ideas. You can call this a diary entry. If you ask me why I didn’t blog this out? Well I just don’t care that’s why. Its just a piece of document, which I felt would be a nice way to record all the emotions that my heart and mind experienced as I make this journey thru life. I am not going to care about grammar here. Spell check is the maximum. I wont be editing any sentence that I put down before any of the last few sentences. I might not even read them again ever. Not unless scrolling down affords me a few glimpses of the same. I write this for the people who know me well. People who have seen me grow.Grow: in terms of understanding the world better. A few handful of friends belong to this category. They would be the only people who would understand what I feel while I write some of the things here. Maybe some day I would do some thing great. Or something impulsive. Some thing good. I wouldn’t care if the whole world knows that I did something worth dying for. The goodness of what I would have done would depend on only what these few of my friends think. They have touched my life in ways more than one. They are a part of me. Whatever I do or would have done , they all have played a part in it. They have been with me long enough to leave some part of themselves in me. If I do something good, they would probably be proud of themselves for accompanying me thru a few walks in life. They would believe more in themselves to have done something right in being a friend of mine. I would be the happiest then! Like Richard Feynmann said : life is like gods playing chess and we are just observers who don’t know the rules. We observe their game and try to figure out the rules and just when we are about declare the completeness of the rules we have thus far formulated, one of the players does “castling” and its back to the drawing board for us. A new phenomenon requires a new theory to explain it. Why cant we just record such phenomenon as exceptions to the existing theory and move on?... probably because man hates uncertainty, or better still, because we feel the need to do something about them (the exceptions)!.. scientists wont like to be jobless either. There are many thought that come to peoples mind. People form religious groups, orkut societies, discussion forums, blogs, news paper columns, TV shows etc etc.. to try to discuss various ideas on a single or varied topics in an attempt to “understand” it better… I believe that the word understand is a misnomer.. all that these people are trying to do is to look at a given topic with as many viewpoint as possible… if that’s what is called understanding then its good… but no one told me or confirmed with me on this before so I am just assuming it.. .. Its like you formulate as many theory as you can about a regular event. All these theories will have some exceptions some where… ie they wont be able to explain everything about that one thing… so when you discuss, you exchange theories and when the time comes we use the theory which suits the best..
Sneha calls me a pessimist.. maybe I am. Would like to die a slow painful death someday. I wouldn’t want another human to be the cause of my death and I wouldn’t want my body punctured in anyway… the kind of death that I love best would be the one caused by trying to stand up against nature itself. It would happen while I am in a forest like the amazon or on one of the poles or something like that. The situation would test my physical and hence mental endurance to the max. I would be just one man against nature. There would be only two ways out.. either I endure long enough till nature takes pity on me and spares me only to get me at some later time.. or if my time has come and my body fails me and nature overwhelms me.. I think of death often. I remember Shomika often too.. I could go on forever and ever before I pen down my current thought.. after all there has to be the seed somewhere.. what’s the point preparing the ground if you aren’t going to sow the seed .. I watched Rang de basanti with Sneha… She and I were the only one in my class who hadn’t seen the movie. She was the best friend I could have watched the movie with. Not sure what makes me say that but given a chance I wouldn’t have watched it with anyone else. Immediately after we watched the movie we weren’t that much impressed by the movie. We both like it but couldn’t understand the fuss about it. We thought it wasn’t worth watching twice. Sneha and me still think it isn’t worth watching twice. But after thinking about it more and more… I have increased my liking for it. I had been waiting for some instrument of inspiration like this for quite sometime now. “The fountainhead” came close but it wasn’t powerful enough to be it by itself. RDB adds to its force. Both things.. the book and the movie, are unrelated, but they teach you recognize what’s probably the right from the wrong and do something about the wrong. I still am not sure how exactly to define right or wrong .. maybe anything which helps us to flourish (read reproduce to increase our population and still at the same time be peaceful).. for example: kill corruption to kill poverty to enhance the lives of the poor so they can too can reproduce fruitfully (healthy progeny with lower mortality rate.. due to lesser diseases.. etc etc)… long chain seemingly leading to lesser chaos but actually leading to more randomness when looked at it from the “whole universe “ point of view. What’s the logic? simple: more humans means more entropy creators and …..
"An important law of physics, the second law of thermodynamics, states that the total entropy of any isolated thermodynamic system tends to increase over time, approaching a maximum value; and so, by implication, the entropy of the universe as a whole (i.e. the system and its surroundings) tends to increase." As I think about it (RDB) more and more everyday, I find better ways to understand life.. (formulate more theories although each will have some exceptions). I don’t know how far this is true but I don’t really care if its true or not.. this explanation brings out the emotion associated with the above phrase in the most complete manner .. “Expression Completed” is what I would say to Deepti while explaining this to her. In the fountainhead, we see that Ayn Rand has divided the world into different kinds of people…. Each of them have some single distinguishing feature in their personality. In real life, people in general can be (maybe?) described as a weighted sum of these basic components of human nature… In the fountainhead, Ayn Rand has split the human nature into its basic constituents .. in a way a prism splits sun light into its basic colors..
After I saw the movie (RDB) Saurabh asked me how I liked it and what was the message I got from it/ what I thought about it. I said that I have a very high probability of doing something like that too.. but he said that’s what we shouldn’t be doing.. ie we should not be impulsive.. Is it really so? Another thought entered my stack for background processing. Very closely associated with the beauty of the mountains are some special emotions which the highest and wildest peaks provoke. I feel a special excitement when I look out over thousands of square, miles of untouched country. I feel it again when I walk where only a handful of men have walked in, the history of the world, when I explore some hidden ridge or crag, or when I make the first track across a great unbroken snow field. Again I feel a special excitement to be alone in the high silent places of the world tucked close under the sky. Such things are worth a little insecurity and sacrifice. Speaking of aloneness, this brings up two other important values which I find in mountain climbing solitude and companionship. Paradoxically the mountains provide both. The companionship provided by climbing together is almost universally valued by mountaineers. The friendships established are lasting and irreplaceable. When you have walked the feather edge of danger with someone, when you have held his life at the end of a rope in your hand, and he has later held yours, you have an almost impregnable foundation for a friendship. For the deepest friendships spring from sharing failure as well as success, danger as well as safety. There is really no substitute. Indeed, this is one of the regrettable trends in our present civilization. Real friendship is increasingly - difficult. _How often do we see even our best friends? Once a week? Less than that? If we hardly see them, how can we really share joy and tragedy with them? I think men are made for a deeper sort of friendship. If they miss it, they miss something very important in life. Men are made for the close warmth of a friendship tested in danger and adversity. I hope they understood what I wanted to say.. I knew they would.. There are too many things I want to do before Death comes.. But I don’t feel like doing it alone. Maybe I wasn’t made to do anything alone. Maybe I haven’t yet like above. Only the time can test such bonding between two people and when it does test , it would probably be a time when one of them lost something .. something important..
Last night while trying to persuade Ranjit to watch RDB (he doesn’t believe there can be such friendship between two people), we came to talk about the physical damages which we had inflicted on people.. of course unknowingly.. he had cause a hand fracture in some one.. and I had cause a split upper lip I Ritesh Mehta.. Ritesh Mehta - a guy who was always prone to getting hurt.. his face is all covered with scars left by cuts and bruises.. Ranjit tried to explain that by saying that some people just don’t have the basic body defense mechanisms in them..
Coming to one last thought today.. before I make Deepti read this.. she is the only one online now who would understand all this..
March 9 was a weird day. It rained on this day like it never rained before. I use that hyperbole because march is supposed to summer time!. It started raining since morning.. and off course cool breeze was blowin’ too. This the best climate I like.. few showers after long long dry spells. The smells generated when rain first contacts with ground is the best smell ever. All this put me in a really really nice mood. I messaged Deepti about it. On the way to college I could see in a distance that there was a hole in the cloud cover through which the sunlight came through. And as it did, the sunlight was scattered by the clouds or the rain drops and the whole scene was like a halo over the Gilbert Hill. It was mesmerizing. In college all the “Elektorama” people and “Roboticon” people had to assemble in the newly created “Development Lab” . We spent the morning stuffing the stuff from their cardboard boxes into the cupboards. We threw the extra tables and empty boxes outside. All this time Kirti’s job was just to take out things and then put it back.. heheh. As for me, I like arranging things in a neat efficient order. We had proper sections in the lab for soldering, practicing for Robocon, mechanical work, cupboards for storage, computers, displaying certificates and off course displaying out projects!. We had a “Dabba” break in the science college’s canteen. It was fun. Chinmay Barve had bought rajma. I had bought same old same old parathas. After this break we continued arranging and cleaning the new lab. Then for sometime we had to go outside the lab as the staff had to cleaning it up.. sweeping and mopping happened. All this time we were sitting in the easy revolving chairs outside the lab. It was fun. We played truth and “truth” and bugged lots of people. Kirti was the “thing” which was rotated to point to the next victim. This was fun. After truth and truth we went to the canteen. We meaning me , Kirti, Sneha, Smita, Sanket, Barve.. We had lots of stuff to eat: dosa and dosa and masala dosa, fried rice, cholle bhature and noodles and etc etc. It was nice because after so so long Kirti and me actually had a chance to spend some good time together. We couldn’t stop pulling each others legs.. After canteen we went back to the lab.. The usual faltugiri followed. Me and Kirti went to library to find out the next shows timing at Cinemax Sion. It was 9 2 11 at 1615 hrs.. but the sneha, smita and hase spoilsport incorporated ne hamre idea pe paani pher diya…so we returned to work.. Then kirti and sneha started cribbing about shweta and charuta and richa etc not being there when the they themselves were working on getting the project to run..
Waise merui gaalis ka ko asar shweta and company pe hota to nahin but still kirti and sneha feel the need to come and crib about those people every now and then which is okay.. atleast for a change it is someone else (and not me ) who is complaining and cursing kuttegiri and gang. Then Prerna came and I had to help her solder a new relay PCB.. Relays are the best!!. Mr Santosh Ramani had made such a complicated circuit for her to solder.. it was really sad.. why do you need capacitors to drive a relay?.. Tea break followed.. uske bad me and sneha went to “keval arts and crafts” shop… we had to make our way thru the mucky and narrow paths of konkan nagar.. We rarely looked up, there was much too many dangers to look for on the ground.. the wet dirty roads were really a disaster waiting to happen. At the shop we bought oil paints and stickers and sparkle glue for Snehas slam book. 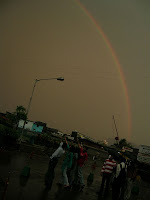 When we returned to college we saw everyone standing outside the college.. looking at A nice big Rainbow. It was the best site ever, we took fotos. It was the largest rainbow ever.. We could even see the second maxima clearly. It was really a breathtaking site. It felt as if our sole purpose of life was full filled. And then the rainbow faded out and we went inside. We got a tub and poured water in it. And then used oil and oil paints to try to make that marble paper which didn’t turn out so good but at least Sneha got the idea how to do it! Maybe she could do a better job than me! suddenly there was a commotion outside and when we came outside, we found out tat Kshirsagar sir had met with and accident. Our college had hired 3 cars for accreditation work and kshirsagar sir was in one of them. They had a really bad accident on a bridge. The car was really crushed and kshirsagar sir was really in pain. One of the other cars had bought him back to college from where he took a taxi to home. Two of the staff accompanied him to his house ..After that we tried decorating a few more paper using sparkle glue .. it was fun!! Then we used the ubiquitous hot air soldering iron the make a few more pages of her slam book by burning patterns in paper. During this time parag and barve were trying to get the central machine … parag tripped over it twice.. looked like the machine was still cursed! After are faltugiri was over we went to tastings in Sajjits car where we encountered a Nepalese waiter boy who had tough time remembering our order.. So our dinner was a bit delayed .. but we had lotrs of fun.. and all this time my mummy, brother and mama mami and cousins were having fun at Inorbit mall! After our visit to tastings, me and kirti took and auto.. kirti dropped me at the bus stop.. it took me 50 mins to get home.. it was cold and the wind flowing into the bus was making it even worse.. I don’t mind the cold but the thing is that you cant sleep in the bus if its cold. 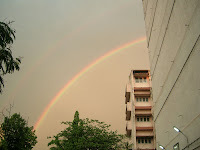 Over all 9th march was really a weird day.. mostly because it rained when it shouldn’t have and we saw the rainbow too.. Like Kirti said .. it was a special day only for me and her.. I will allow her to punch in a few words here and there to make this more complete.. Life is beautiful! Well well well……….it really was quite a special day for me as I had the pleasure to have all of anurag’s attention for a change……….and instead of me hitting on him, he seemed meherbaan on me…………guess the 2 aurat’s influence is waning finally. Phir who mera haat pakadta hai aur kehta hai ki yaar ab main haath nahi chodoonga. Finally he wrote out “kirti” on a sticker and said he would stick it on his t shirt near his dil………talk about mushy………. So yes it was an unconventional day becoz for a change, I was getting wooed and to confess, it felt rather good. But then I do know that anur’s attention is going to be rather shortlived and his new found affection for me will soon wane ………… becoz I really think I wont b able to match the 2 auratein…………….. Yet I will cherish my only romantic evening with anurag…………kya pata …….kal aisi khushi mile na mile.